UPDATE: 7:28 a.m. EST -- U.S. President Barack Obama said Friday that he is monitoring the situation in Mali where attackers have taken 170 people hostage at the Radisson Blu Hotel in capital Bamako, according to the Associated Press. The White House also said that the president had been briefed about the attack. Air France said in a statement that its crew staying at the hotel have been freed and are safe. Meanwhile, French President François Hollande said everything is being done to rescue the hostages. “I want to assure all Malians of our solidarity and support for them and I urge all French nationals who are in the affected to be vigilant at this time,” Hollande said, according to the Guardian. The Guardian reported, citing French newspaper Liberation, that the country is sending 40 elite French police officers to Bamako to tackle the hostage situation. The Gendarmerie Nationale tweeted a photo saying that they are on their way. UPDATE: 6:48 a.m. EST -- Mali’s presidency said Friday that President Ibrahim Boubacar Keita cut short his trip to a regional summit in Chad after gunmen stormed into the luxurious Radisson Blu Hotel in the center of the capital Bamako early morning and took 170 people hostage, Reuters reported. At least three people are reported to have been killed amid the ongoing hostage situation. According to Mali's state-run news network, cited by the Guardian, 80 of the 170 hostages were freed by the attackers. A report by Al Jazeera reportedly said that the Ansar al-Din (supporters of religion) group is responsible for the attack. The Guardian reported, citing a military source, that three jihadis, who entered the building have been killed, but the news has not been confirmed yet. The report also said that the hotel was attacked by a group of six people. A hotel gardener, who witnessed the attack, told BBC: "They have come this way while I was sweeping in the yard," adding: "They were in car with a diplomatic license plate. They were masked. At the gate of the hotel, the guard stopped them and they started firing and we fled." Five Turkish Airlines staff members -- a station chief, two pilots and two flight attendants -- were freed from the hotel, the Guardian reported. Agence France-Presse reported that 20 Indians were also kept hostage at the hotel. China's state-run news agency CCTV News said that 10 of its nationals were among the hostages at the hotel. 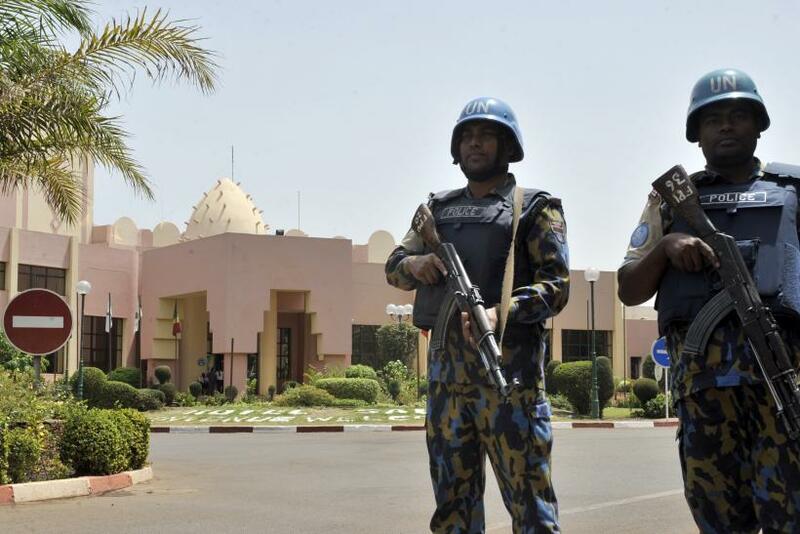 UPDATE: 5:37 a.m. EST -- An official from the United Nations told CNN that two Malian citizens and a French national have been killed in the ongoing hostage situation at the Radisson Blu Hotel in the Mali capital Bamako. 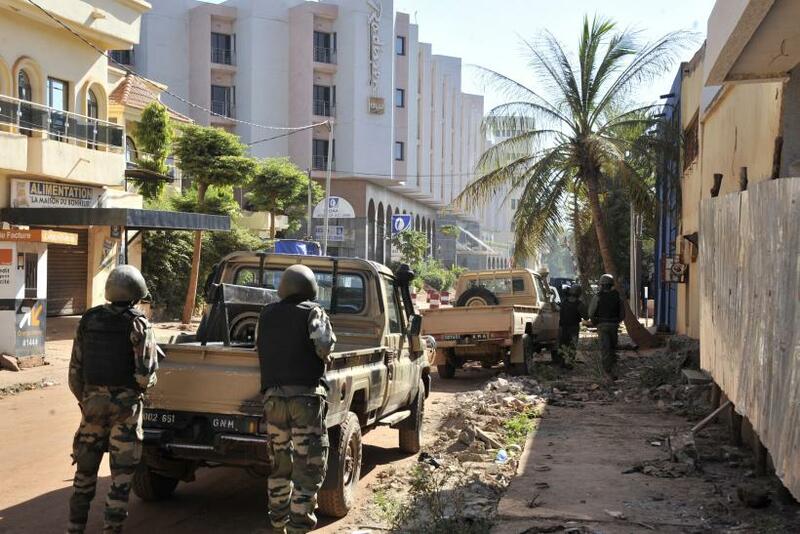 Mali army commander reportedly said that 20 hostages have been freed from the hotel. Two attackers had taken 170 people at the hotel hostage at around 7 a.m., local time, Friday (2 a.m. EST). No group has claimed responsibility for the attack, which comes just a week after a series of attacks in France killed 129 people and injured about 350 others. Mali’s special forces are present at the site, while France is providing logistics and intelligence support, Reuters reported, citing a French diplomatic source. Six employees from Turkish Airlines were among those held hostage, an official told the news agency. A French presidential source also reportedly said that French people were being held hostage at the hotel. 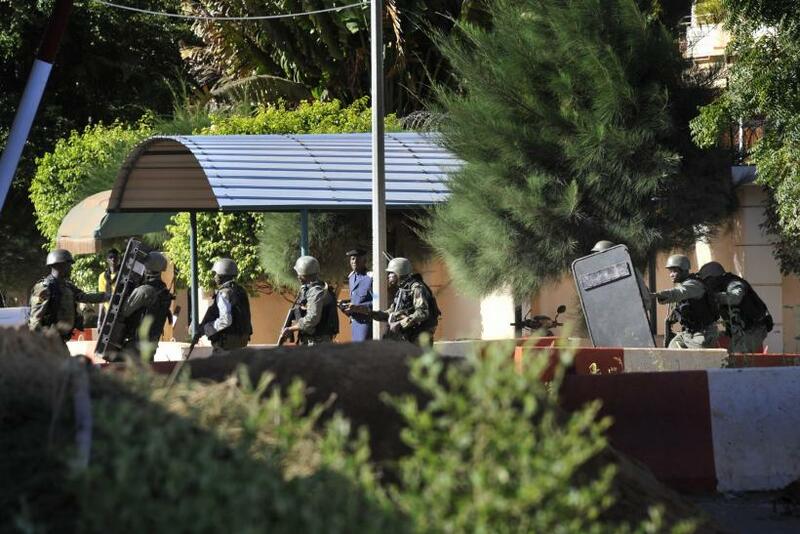 According to a tweet by Agence France-Presse, Mali's security forces are now storming into the building. 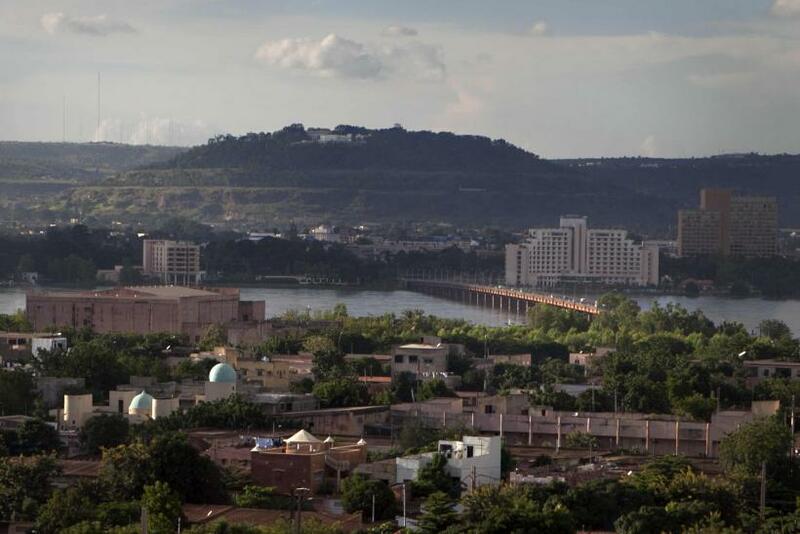 UPDATE: 5:14 a.m. EST -- A report by Reuters, citing security officials, said that the attackers, who stormed into the Radisson Blu Hotel in Bamako, Mali, on Friday, are releasing some hostages who could recite verses from the Quran. Agence France Presse reported that security forces on the site escorted two women out of the hotel. UPDATE: 5:03 a.m. EST -- At least two security guards were injured in the attack on Friday at the Radisson Blu Hotel in Bamako, Mali, where two gunmen took 170 people hostage, Reuters reported. Chinese state-run news agency Xinhua said that several Chinese tourist were “trapped” in the hotel in the ongoing hostage situation. "A Chinese guest surnamed Chen told Xinhua via WeChat mobile app that he was among a number of Chinese guests trapped in the hotel," Xinhua reported. UPDATE: 4:29 a.m. EST -- Rezidor Hotel Group, the operator of the Radisson Blu Hotel in Bamako, Mali, told International Business Times in an emailed statement that the company was aware of the ongoing hostage situation at its property Friday. It said that two attackers had locked 140 guests and 30 employees at the hotel. “Our safety & security teams and our corporate team are in constant contact with the local authorities in order to offer any support possible to re-instate safety and security at the hotel. At this point we do not have further information and continue to closely monitor the situation,” the company said. A security source told Agence France Presse, according to BBC: "It's all happening on the seventh floor, jihadists are firing in the corridor." Gunmen have attacked the Radisson Blu Hotel in Bamako, Mali, and are believed to be holding hostages at the 190-room luxury property, Reuters reported Friday, citing senior security force officials and witnesses in the area. The hotel is reportedly popular with expats, according to the BBC. "Very early in the morning there was gunfire. Apparently it's an attempt to take hostages. The police are there and are sealing off the area," a source told Reuters. "It's all happening on the seventh floor, jihadists are firing in the corridor," a security source told Agence France Presse (AFP), according to BBC. The U.S. embassy also acknowledged an ongoing attack at the hotel and asked its nationals to take shelter, the Associated Press said in a tweet. According to a report by Bloomberg, which cited AFP, there was exchange of gunfire between the attackers inside the hotel with automatic weapons and security forces. The report also said that a security perimeter had been established.